Craft Supplies for your Easter Projects! Now Available in my craft supply shop! So just when is this plan going to kick in? Things have been difficult for your family, for most families the last few years. You’re tired of struggling against obstacles in your life that seem out of your control, beyond your ability to overcome. You may have even resigned yourself to circumstances, believing nothing is ever going to change. They can change and you can make it happen when you claim your life and clear it, beginning with the 4 major obstacles standing in the way of your hope and future. 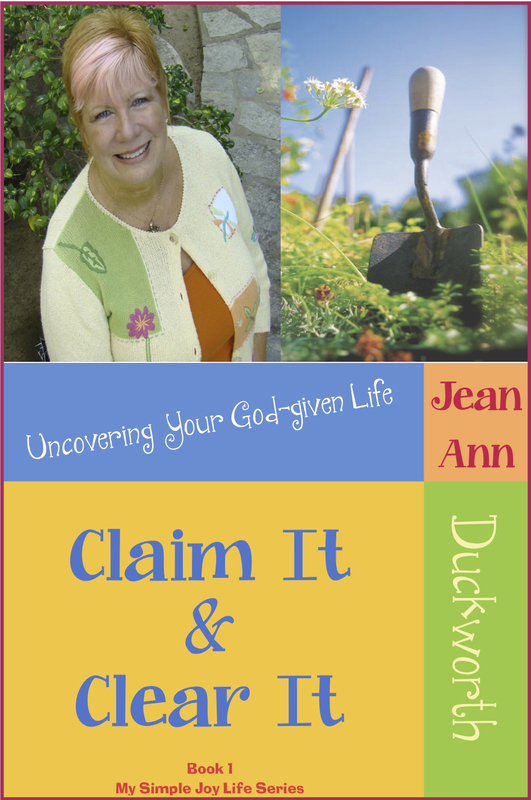 In Claim It & Clear It: Uncovering Your God-given Life, Jean Ann Duckworth offers an analogy that simplifies your situation into a more manageable scenario. Jean Ann begins with a description of an overgrown piece of land, property overcome by trees in various states, rocks, ruts and holes and brush. Before anyone can build on the land, these 4 obstacles must be cleared out of the way. Jean Ann then goes on to show how each obstacle on the land represents an obstacle in your life that can be overcome in the same way each natural obstacle must be overcome. By focusing on these 4 key obstacles in the life of your family, you are able to regain control of your life, your hope and your future step-by-step, no matter how small those steps may be. These 4 obstacles, in nature and life, are: Trees/Financial Instability; Rocks/Discouragement; Ruts and Holes/Insecurity; Overgrowth and Brush/Isolation. Jean Ann takes you through each of these obstacles, offering ways to regain control over them and your life. Throughout the book, Jean Ann includes exercises to enable you to apply the material to your life. She also has scattered Scripture verse and additional reading to help you become stronger in your struggle against all the obstacles. God does have a plan for your life and it begins when you make a commitment to reclaiming control of your life and clearing the obstacles standing in the way of your prosperity, hope and future. Frazzled Moms’ Devotions To Go covers all the “mommy types.” From scripture meditations and devotions to activities to build their relationship with God, their family and friends, and the stranger in the mirror, this devotional will touch mothers of all ages. Frazzled Moms touches on real issues with laughter and encouragement. It leaves the reader enlightened and feeling God’s presence and peace. The prayer for each day is an example of real prayers. Not flowery ones that you find in most devotionals. This shows the readers that they can speak with God in their own voice; there is not a special way to speak with God, just be that child that He calls for. This devotional is unique compared to the others because it reaches all types of moms, with all types of needs. Everywhere you look, some form of media is presenting images of women as absolute benchmarks for beauty. Society would have us to believe that all women are to resemble these often unrealistic images. Diva’s Devotions to Go studies God’s purpose in making each of us unique and helps women to accept and appreciate their own beauty. This thirty-day study takes a woman through laughter and tears, self-assessment and prayer and to the root of her special beauty. Each woman is beautiful inside and out and why shouldn’t she be, she was created by the master creator. Every woman is a diva, meant to live life with humble confidence and appreciation for her creator and to live life abundantly. Divinely inspired life is Diva-licious! Wear your Diva lenses as you turn the pages in Diva Delights Devotions to Go and find “aha” moments– a memory triggered by eating a favorite snack once enjoyed with friends, a remarkable object lesson hidden in a household gadget, treasures uncovered in basement storage bins, or God’s faithfulness accompanying you as you develop stretch marks! Diva Delights Devotions to Go will lift your spirit as you discover your extraordinary treasures in ordinary days. LeAnn Campbell uses the book of Proverbs as a guidebook for writers. Every chapter has one or more nuggets of wisdom to motivate writers. There is guidance for perfecting your craft, choosing words carefully, and handling criticism. Listening to instruction, dealing with rejections, and working diligently instead of acting like a lazy sluggard—Proverbs covers it all. Proverbs 19:2 (NIV) could be a motto for writers: It is not good to have zeal without knowledge, nor to be hasty and miss the way. Writers’ Devotions to Go covers all this and many more situations that writers face. It includes web sites for contacting writers’ organizations, suggestions for writers who want to establish local groups, guidelines for critique groups, and web sites to determine whether information you get over the Internet is the truth or a hoax. Stressed Out? Living in the fast lane? Need to get off the highways and onto the byways of life? What mom doesn’t need to slow down and take a break from juggling kids, work, meals, laundry and the household? What about just a few minutes of down time? Good news for the frazzled and frenzied! Stressed Out Moms’ Devotions to Go is full of encouragement for stressed out moms and will provide that break. Each of the 30 devotionals offers you practical advice from the trenches of real life. Planning your menu for a special event can be challenging. One of the biggest challenges is to make your meal interesting without going over the top AND without causing yourself an incredible amount of stress. For these reasons, I LOVE it when I find a recipe will add a freshness to my menu but is simple to make. 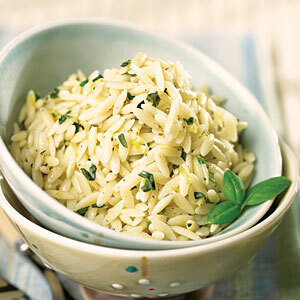 This Lemon Basil Orzo with Parmesan MyRecipes.com is the perfect example. It is simple to make, will add a freshness to your meal & goes perfectly with your Easter menu. Enjoy! Kathy encourages moms to grab this book along with a Big Mac or Whopper to have some soul food. Soccer Moms’ Devotions To Go is full of sports stories and the principles and enduring lessons we can learn from all those games and practices. It is Scripturally based, is written for tired and worn out moms, and aims to give them a little spiritual food while they are driving their kids all over creation to participate in extracurricular activities. It points to enduring truths that can be cherished along with the lasting memories our kids give us when they play sports.